Здесь вы можете прочитать биографию Билла Клинтона на английском языке. Bill Clinton (19.08.1946) - American President. 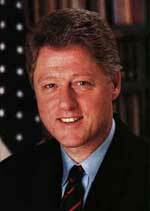 Clinton, Bill (William Jefferson Clinton), 1946–, 42d President of the United States (1993–2001), was born town Hope, state Arkansas. His father died before he was born, and he was originally named William Jefferson Blythe 3th, but after his mother remarried, he assumed the surname of his stepfather. After graduating from Georgetown Univ. (1968), attending Oxford Univ. as a Rhodes scholar (1968–70), and receiving a law degree from Yale Univ. (1973), Clinton returned to his home state, where he was a lawyer and (1974–76) law professor. In 1974 he was an unsuccessful Democratic candidate for the U.S. House of Representatives. Two years later, he was elected Arkansas's attorney general, and in 1978 he won the Arkansas governorship, becoming the nation's youngest governor. Defeated for reelection in 1980, he regained the governorship in 1982 and retained it in two subsequent elections. Generally regarded as a moderate Democrat, he headed the centrist Democratic Leadership Council from 1990 to 1991. The late 1990s saw a number of foreign-policy successes and setbacks for President Clinton. He continued to work for permanent peace in the Middle East, and his administration helped foster accords between the Palestinians and Israel in 1997 and 1999, but further negotiations in 2000 proved unsuccessful. Iraq's Saddam Hussein increased his resistance to UN weapons inspections in the late 1990s, leading to U.S. and British air attacks in late 1998; attacks continued at a lower level throughout much of 1999 while the issue of weapons inspections remained unresolved. In Apr.–June, 1999, a breakdown in an attempt to achieve a negotiated settlement in Kosovo sparked a 78-day U.S.-led NATO air war that forced Yugoslavia (now Serbia and Montenegro) to cede control of the province, but not before Yugoslav forces had made refugees of millions and killed several thousand. In the course of the 2008 Democratic presidential primary campaign, Clinton vigorously advocated on behalf of his wife, Hillary Clinton. Some worried that as an ex-president, he was too active on the trail, too negative to Clinton rival Barack Obama, and alienating his supporters at home and abroad. Many were especially critical of him following his remarks in the South Carolina primary, which Obama won. Later in the 2008 primaries, there was some infighting between Bill and Hillary's staffs, especially in Pennsylvania. Based on Bill's remarks, many thought that he could not rally Hillary supporters behind Obama after Obama won the primary. Such remarks lead to apprehension that the party would be split to the detriment of Obama's election. Fears were allayed August 27, 2008, when Clinton enthusiastically endorsed Obama at the 2008 Democratic National Convention, saying that all his experience as president assures him that Obama is "ready to lead". Also in 2009, Clinton was named United Nations Special Envoy to Haiti. In response to the 2010 Haiti earthquake, U.S. President Barack Obama announced that Clinton and George W. Bush would coordinate efforts to raise funds for Haiti's recovery. In 2010, Clinton announced support and delivered the keynote address for the inauguration of NTR, Ireland's first ever environmental foundation. Clinton actively participated in Barack Obama's election campaign during the 2012 presidential election.